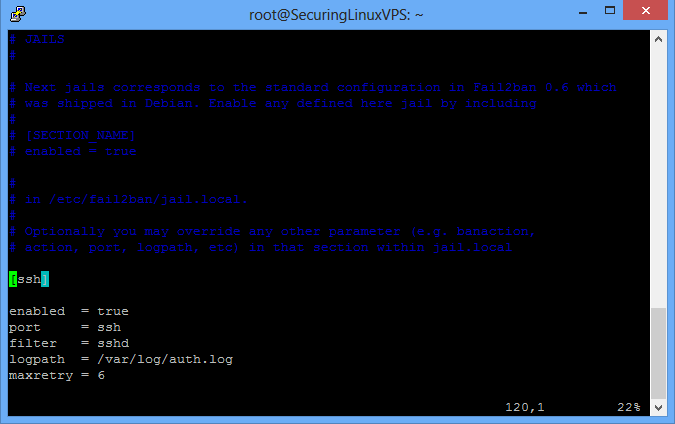 Fail2ban is a great, wonderful service that is primarily used to stop brute-forcers from accessing your system. Fail2ban works great at deterring your basic attackers away by blocking them when it determines an attack may be happening. We will be performing steps below as the root user. You will need to sudo if you are using another user. For all editing of configuration files, we will be using vi; however, you can use any editor of your choice. This installation is performed on an Ubuntu 14.04 64bit Cloud server with IPTables installed per our IPTables guide. This guide is also applicable to our Ubuntu 12.04 OS and Debian. Once you’ve made that .local file, it’s time to edit it with your editor. Now as you’ll see when editing the file, there are A LOT of sections for you to “play” with and adjust. The main ones we’ll focus on are the ignoreip, bantime, findtime, maxretry, and specifically [ssh] sections. Note: In Ubuntu 12.04 and Debian, the configuration file looks a bit different from the above. You will only see ignoreip, bantime, and maxretry. The rest of the configuration as far as we are concerned here is the same. In the picture above, at the green indicator at the top, you will find the ignoreip. The ignoreip is important as you can tell fail2ban to IGNORE your IP address. Setting ignoreip to the correct IP will prevent you from ever locking yourself out of your server by fail2ban. We highly recommend you add your IP address to this field. To add it, all you need to do is add a space after the 127.0.0.1/8 and put your IP. Below the green indicator, you will find the bantime. As it states, this is how long a host is banned when triggered for banning. The bantime is the number of seconds that you want that IP address blocked from your system. We recommend that if you are gunning for someone to be blocked, you set this to a high number. The default is 10 minutes. Adding a 0 will make it 6000 seconds or 100 minutes (just over an hour and a half.) That’s a good start. In Ubuntu 14.04, the next section is the findtime. As it states, this is the span of time fail2ban will look at for failed attempts. The default setting here of 10 minutes (600) is acceptable. Under the findtime (or bantime in Ubuntu 12.04) you will find the maxretry. As it sounds, this is how many times you’ll be allowed to fail the log in within the findtime before the origin IP gets added to the ban for what you have set the bantime to be. 3 is a great number here to catch someone attempting to get in. The last section we’ll look at is for [ssh]. You can see the section in the picture below. The biggest thing here to edit is the maxretry (each section can re-write your default maxretry to its own value) and the “port =” section. Maxretry in this means how many times a person can fail attempting SSH to your server before they are blocked. The lower this number, the better, but you also want to be safe to allow some retries, just in case. Now once you have changed this configuration to your liking, all you need to do is save the changes you did and exit the file. Once out, just restart the fail2ban service to activate it. If you check your rules.v4 file, you will see that there is now a rule for fail2ban in place. This is the rule fail2ban put in place when it was installed and is needed to stop anyone who is blocked by fail2ban. In the future, when adding new services on the server (like FTP, email, etc) make sure you check your fail2ban configuration!